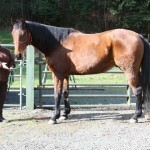 Chance is a Thoroughbred cross gelding who was one of the first horses rescued by SAFE in early 2005. 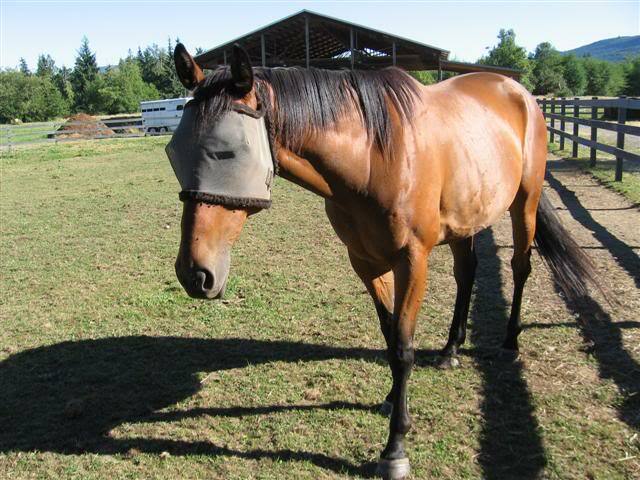 He was bred as a bucking horse, but once they figured out he didn’t have the heart to buck, they sent him off to slaughter where he was rescued by SAFE. 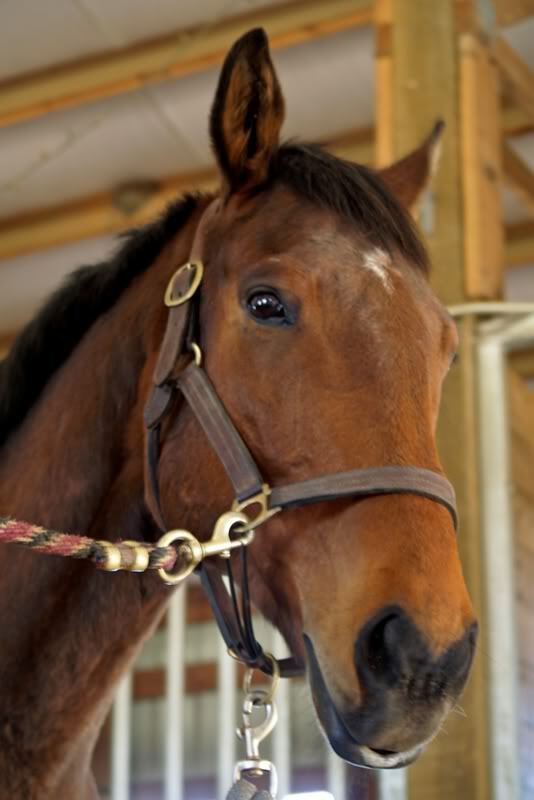 The Exceller Fund stepped up to pay for a couple of months of training for him. 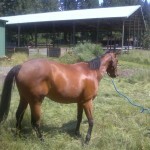 He was soon doing very well under saddle, as he was apparently very uncommitted to being a bucking horse. 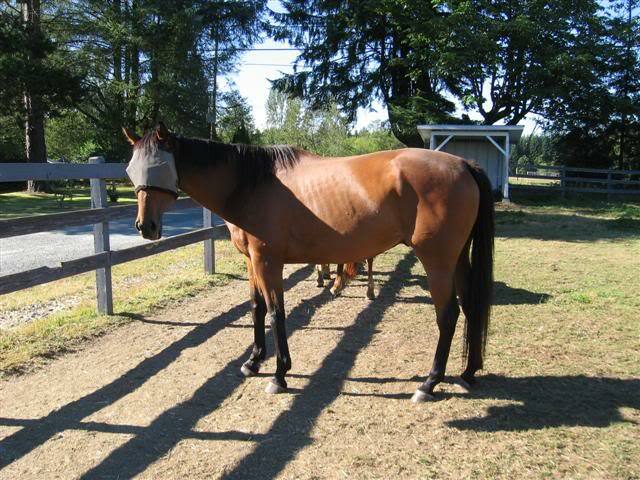 Chance was adopted but in 2012, he was returned to SAFE by his adopter who could no longer afford his care. 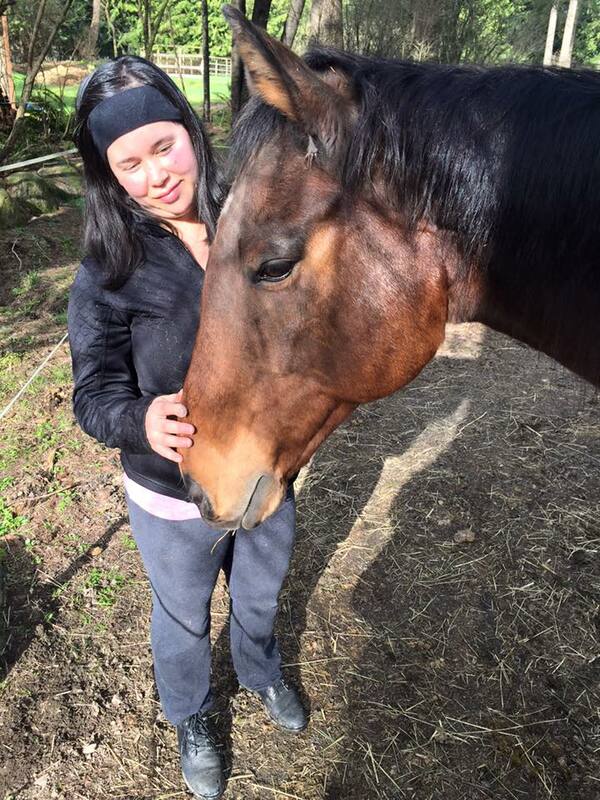 Chance found his person in SAFE volunteer Tracy Green, who fell in love with him while caring for him at SAFE. 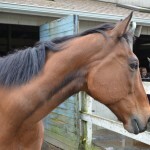 We are absolutely delighted to announce that one of our very favorite horses (Chance!) has been adopted by one of our very favorite volunteers! 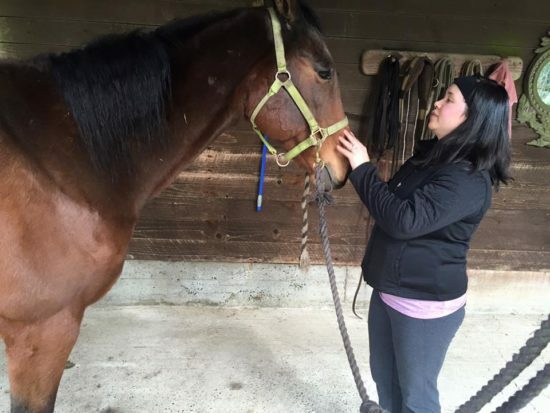 Tracy Green has been volunteering alongside Chance since he arrived at SAFE Harbor Stables and wouldn’t you know, she fell in love with this tall, handsome sweetheart of a horse. Tracy made the decision to adopt Chance just before his shoe boil/abscess flared up, which put his adoption on hold while we struggled to fix him …and his exemplary behavior during his flushings and wrappings surely won Tracy’s heart over even more. 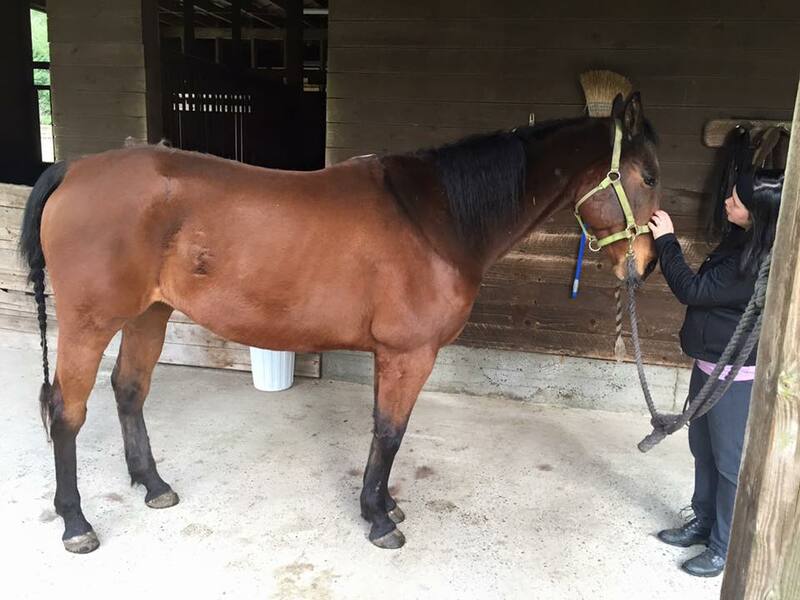 As soon as Chance was healed up and ready to get back to work, Tracy was finally able to ride “her” horse and confirm for once and for all that this adoption was meant to be! I have been spending some time just grooming and walking him around, and last night I rode him for the first time since we moved in. I had a lesson with Holly, she really likes him and thinks we’ll be good together. He is so level‐headed and willing. There were a couple other horses in the arena, and one throwing a bit of a tantrum right outside, and Chance just stayed focused on me and went about our business. I’m feeling really good about this partnership so far! I tried to get a picture of him for you all tacked up and handsome but my phone died — I’ll try again Saturday. Congratulations to Tracy and Chance! Have a wonderful time together and please keep the happy updates coming! Great news…Chance’s drain came out today. Brittney reports that his wound is closing up nicely, so in a few days we can hopefully release him from the high‐line in his stall so that he can lie down again if he want to. He’s been getting SMZs to fight infection in the wound, and those are fed to him by hiding them in a mash, which he loves. He’s been a very, very good boy for his twice‐daily flushings and cleanings, despite the fact that it hurts and he does not like the feel of water running down his leg. We are very proud of him for tolerating his treatment so well. We’re also super grateful to Terry and Brittney and the volunteers for nursing him through this issue. 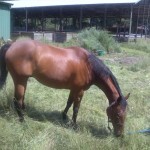 Looks like we are on track for a full recovery, which is great news for this very nice horse. Chance’s shoe boil blew up again and Dr. Hannah was called out yesterday to look at it. Dr Hannah was initially going to just try another round of antibiotics, but after examining it decided that because there was a tremendous amount of fluid and that it should be lanced and drained. She also installed a drain to help us keep it clean and keep it healing correctly from the inside out. So, Chance is back to SMZs twice a day as well as twice daily cleaning and flushing of the wound. Chance is being a good boy for his treatments, but it is painful and uncomfortable for him. We will do everything we can to help him through this setback. Unfortunately, Chance will have to miss the SAFE Show this year, but our main priority is getting him healthy again. Please keep thinking healing thoughts for Chance. 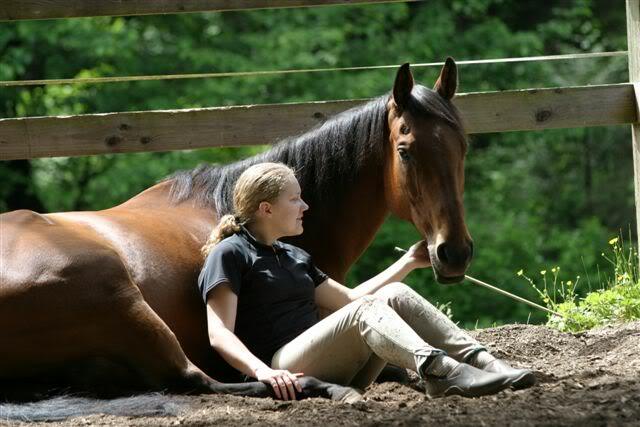 Photographer Karen Wegehenkel took this gorgeous photo of Chance when she visited SAFE Harbor Stables. She also took some incredible photos of Kat, Lola, Miah, Ginger, Nora, Maggie, and Portland. We will be sharing them with you over the next few days. You will be blown away by these beautiful images! Sorry to share that Chance is not feeling well and had to see Dr Hannah yesterday for an emergency visit. He did not seem to be himself on Wednesday and volunteers reported that he was not moving around much or interested in food. Yesterday morning we discovered that his elbow was significantly swollen and giving off heat. Hannah came out to examine him and found that he had spiked a fever and had developed cellulitis in the elbow. He’ll be on bute and SMZs for the next seven days and wrapped from stem to stern. Please think good healing thoughts for our boy! 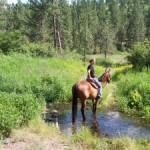 Chance and Kat go on a trail ride! 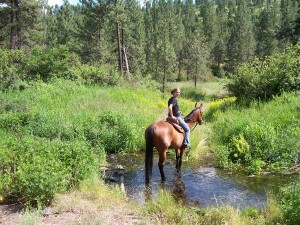 Chance went for his first trail ride as a SAFE horse today, accompanied by Kat. Chance has a lot of experience as a trail horse but it’s been a little while since he’s been out in the woods, so he started his journey into the Redmond Watershed by doing a fair amount of jigging, but after about 5 minutes, he settled down and started walking in a relaxed manner and kept his cool for the rest of the ride. The trails at Redmond Watershed have bridges that cross the creek in several places, and Chance was completely unfazed by these, crossing every single bridge without concern. He displayed the same bravery towards the various park benches, gravel piles, and fallen logs that he passed. Kat, on the other hand, had a few moments of over‐reaction to some of these harmless obstacles, but once she saw that Chance was unimpressed with her antics, she too settled down and took everything in stride. All in all it was a successful day for both horses. On the ride, I had the opportunity to ask Brittney how Chance has been doing in his training rides, and she says she’s been enjoying riding him so far. 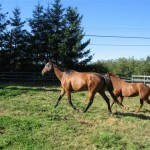 He does have a pretty bouncy trot, but she says that as he’s been regaining fitness, his trot has gotten easier to sit. 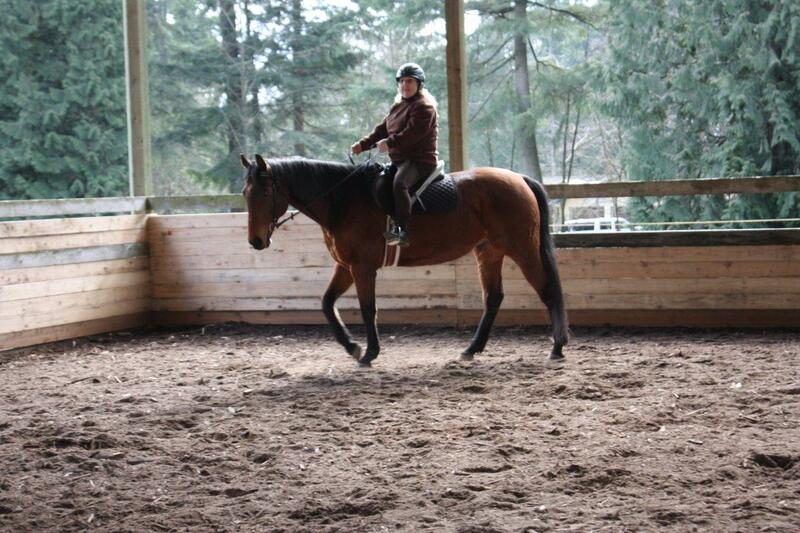 His canter is still a bit of an adventure to ride, but it’s coming along pretty well too. 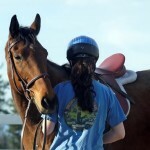 He’s well‐behaved under saddle, and does a pretty good job focusing on his work. As we’ve mentioned before, Chance has a pretty severe case of ear plaque which makes it pretty painful to have his ears touched, and he’s gets pretty worried that someone is going to forget. 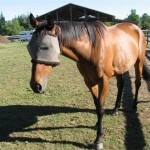 Brittney deals with this by unbuckling most of his bridle so she can put it on without having to touch his ears. She was a little worried about doing this at the trailhead, but he was a good boy about it so it wasn’t really a problem. 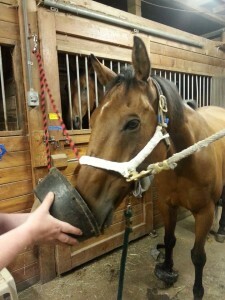 He’s a really sweet horse who doesn’t ask for much, so we try to accomodate this quirk of his in a positive manner. Brittney’s had the opportunity to work with Chance a few times since his arrival at SHS, and she likes what she sees so far. 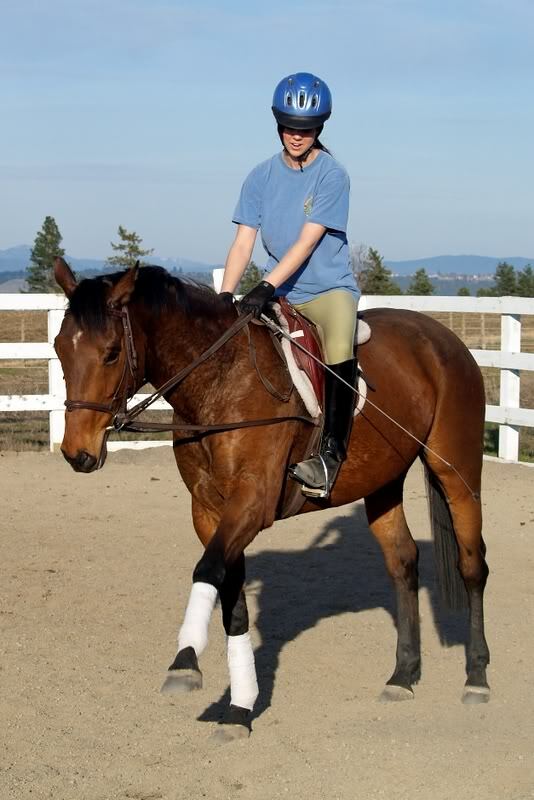 She says he’s a good boy, and she’s even tried having one of our volunteer riders hop on him and he did very well for her too. 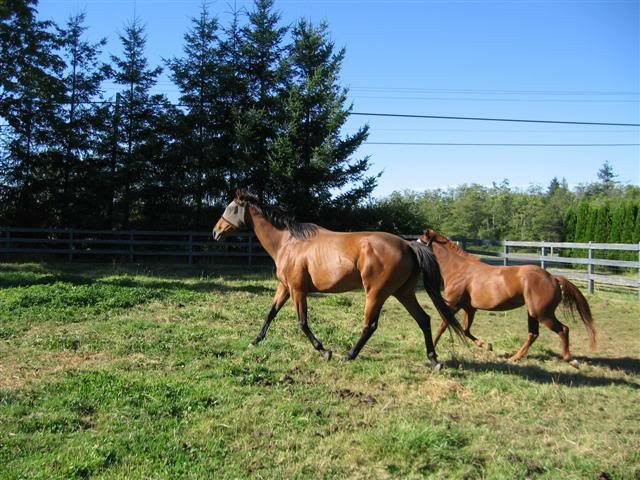 He’s pretty unfit, so he’s crossfiring in the canter and getting himself a bit discombobulated, but with more work, she’s confident he’ll work through those problems pretty soon. 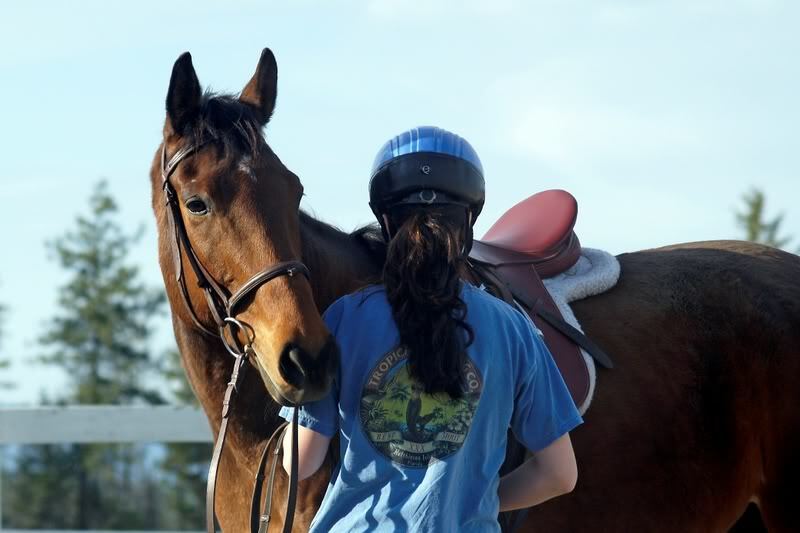 She’s planning a trail ride for him in about two weeks to give him some more time to gain fitness. 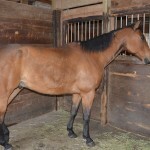 Chance has had to adjust to the hustle and bustle of SAFE Harbor Stables, which is a bit different from the quiet, private home where he’s been living for the past several years. Reports of his ear touching phobia have turned out to be quite true—Brittney says that he seems extremely worried that she’s going to forget and touch his ears, and he does not like that one bit! 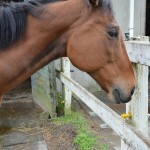 So bridling him is quite a chore…she has to take the bridle apart to get it on him, she can’t just unsnap the browband. This will probably be a challenge for his new owner as well, but we hope that when the right person comes along for Chance, he or she will be willing to accept this quirk of his and work around it in order to keep him happy. He’s a big, sweet goofy boy, and he’s certainly worth a little bit of extra effort! 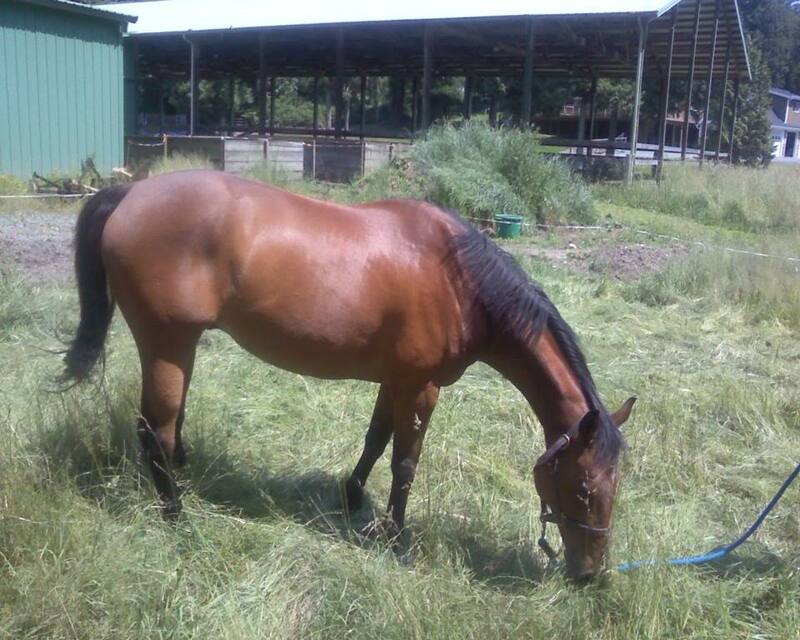 Chance has arrived at SAFE Harbor Stables where he will be starting back into work with trainer Brittney Stewart. 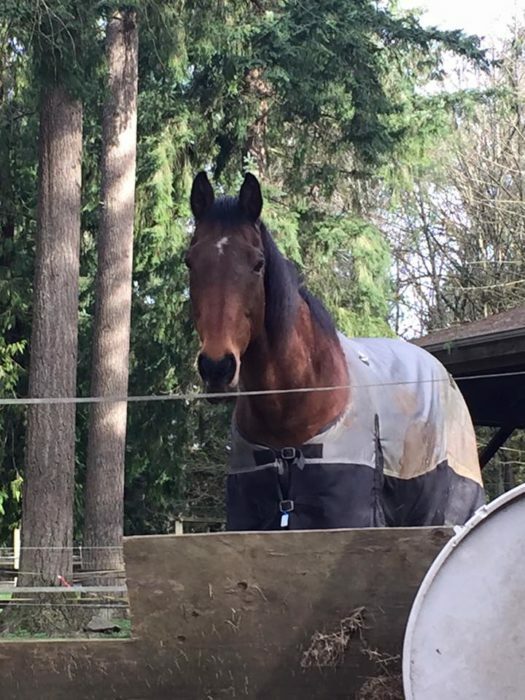 Chance has done a lot of under saddle work in the past, mostly on trails, but he’s been living a life of leisure since his return to SAFE last fall. 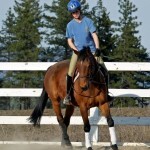 But now he’ll get a chance to show what he can do as a riding horse. We hope to have video to share with you once he gets back into work. First pasture turnout of the spring! Chance demonstrates that multitasking means bucking and farting, while his friend Summer demonstrates her version of multitasking…laying down and eating. 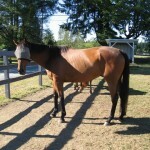 Chance is a Thoroughbred cross gelding that was one of the first horses rescued by SAFE in early 2005. He was supposedly a failed bucking stock horse who was so sweet and friendly that no one wanted to see him be sent to slaughter. 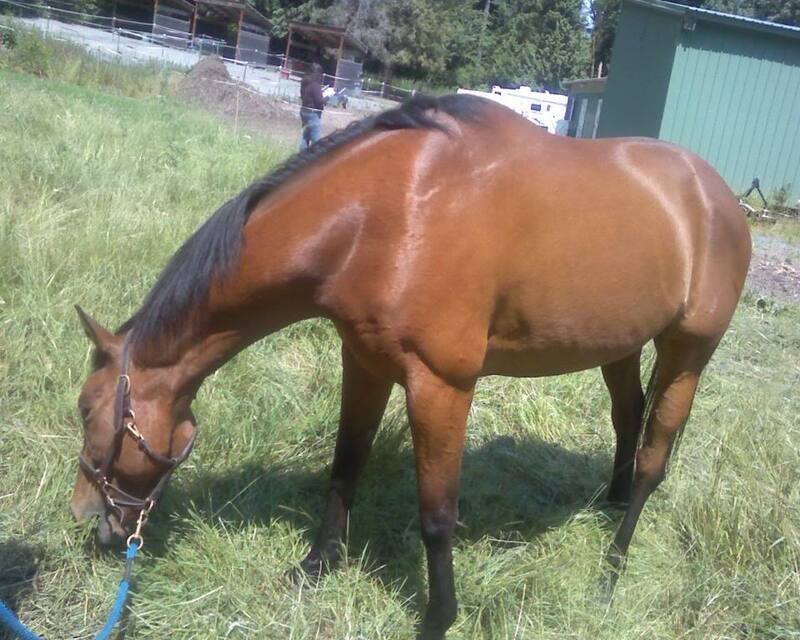 SAFE paid his feedlot ransom, and the Exceller Fund stepped up to pay for a couple of months of training for him. He was soon doing very well under saddle, as he was apparently very uncommitted to being a bucking horse. 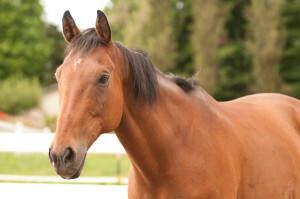 He was bred as a bucking horse, and I can only assume the unpleasant way in which he was handled/treated and “started”. Once they figured out he didn’t have the heart to buck they sent him off to slaughter where he was rescued by SAFE. As a result of his tough start in life, he has some trust issues. But once you build a relationship with him, he bonds deeply. 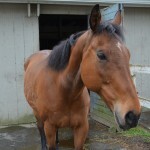 Chance needs an intermediate rider because he is a typical TBx…he is big, strong, and fast. He can sometimes get a little unconfident/worried. He needs someone who can stay centered and calm and insist that he keep his mind focused on what he is being asked to do. A confident rider with a good seat will have no trouble. 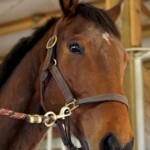 He is ridden in a snaffle if that tells you how easy he is. 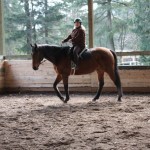 I have never seen him buck under saddle. 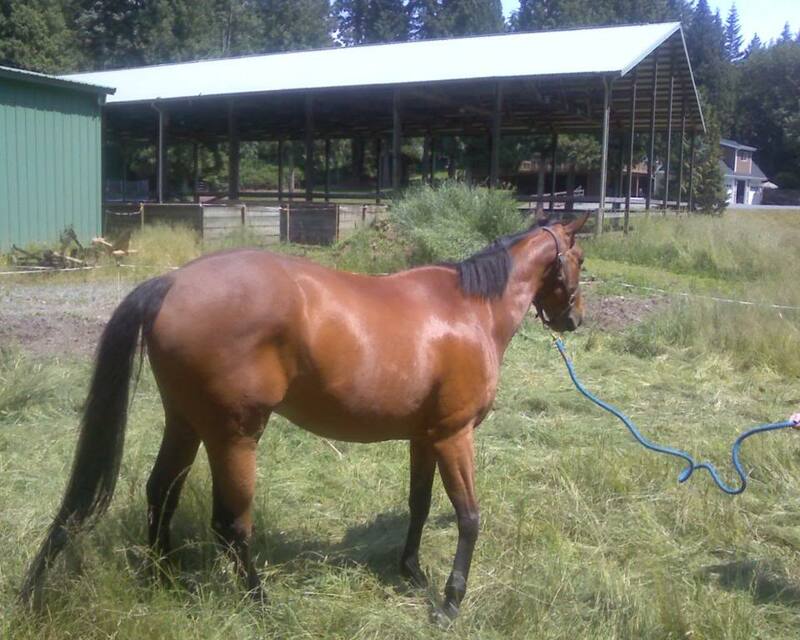 The one time I saw him spook under saddle was at a four wheeler going fast and loud. Couldn’t really blame him for that one. Chance has mild fibrotic myopathy in both hind legs. Essentially, it is scar tissue in the hamstrings. 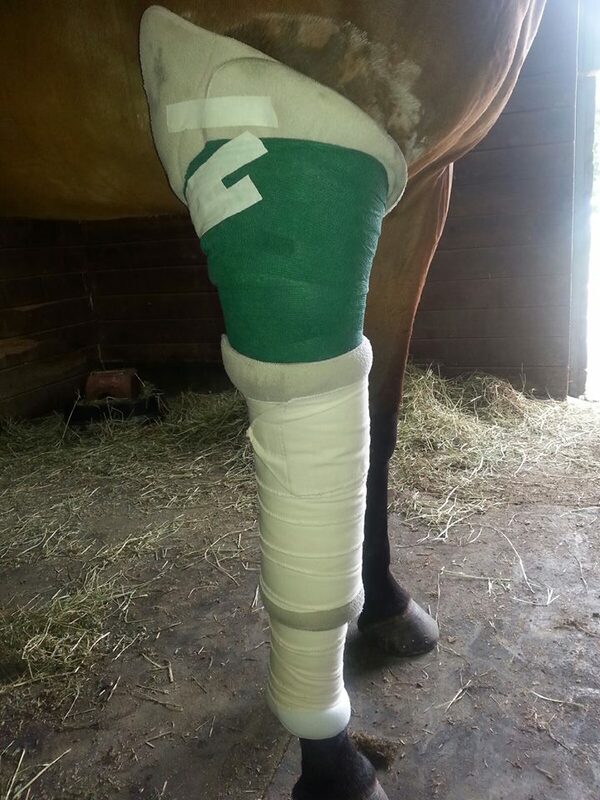 Possibly due to an injury while at bucking school. It is a mechanical issue, which means he has less than perfect movement (drags his hind toes just a bit at the walk). It is not a soundness issue…he is never lame and it does not cause him any discomfort. 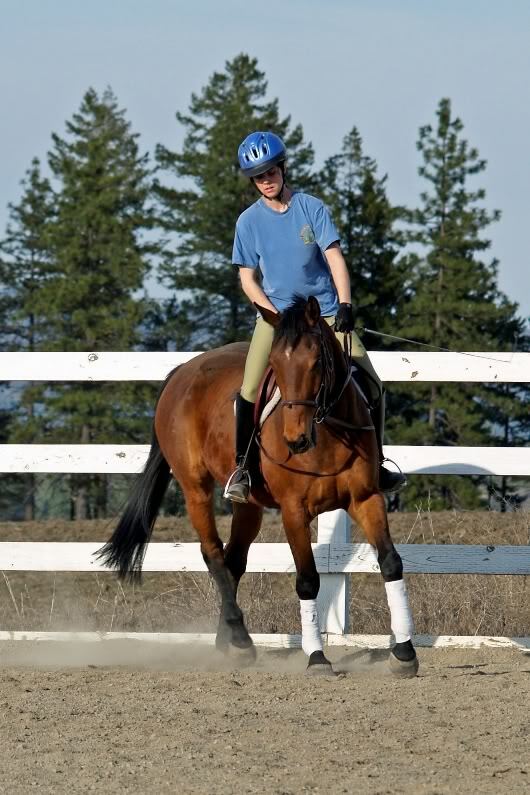 Again, it does not prevent him from being ridden, and in fact he jumps a little as well. Probably not a good candidate for dressage. When I acquired him, he was barefoot. We put shoes on the front because we wanted to trail ride. After a couple instances of hind hoof abscesses, I opted to put shoes on behind as well. Not a single abscess since the shoes went on, so they have stayed on. Chance has no vices…no cribbing, chewing, weaving or anything obnoxious. He respects hot‐fence. 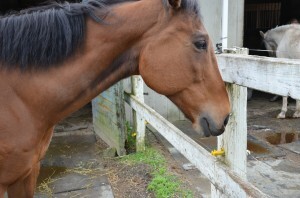 He is submissive (bottom of the pecking order here) so doesn’t stir up trouble with other horses. He trailers well, rides well on the trail with other horses, etc. 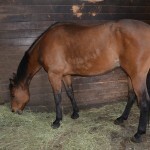 He is a relatively easy keeper for a TB, he eats 2 flakes timothy 2x day plus about 5# of Strategy. He is a tiny bit chunky right now due to less work. When he is being ridden regularly, this amount of food keeps him at a nice weight. He does not do well on grass hay, gives him the runs. I haven’t tried him on alfalfa. 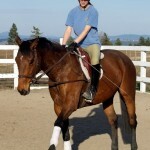 He is easy to catch and tack up (with the bridle taken apart as described). He stands for the farrier, and the vet. He is UTD on all vaccines and currently does not need floated. He is shod every 8 weeks. He does not bite, although if you scratch him he will offer to “groom” you as though you are another horse. It is humorous, but can cause alarm to someone who doesn’t understand. Chance is too young to be retired and deserves better than standing around in a paddock. 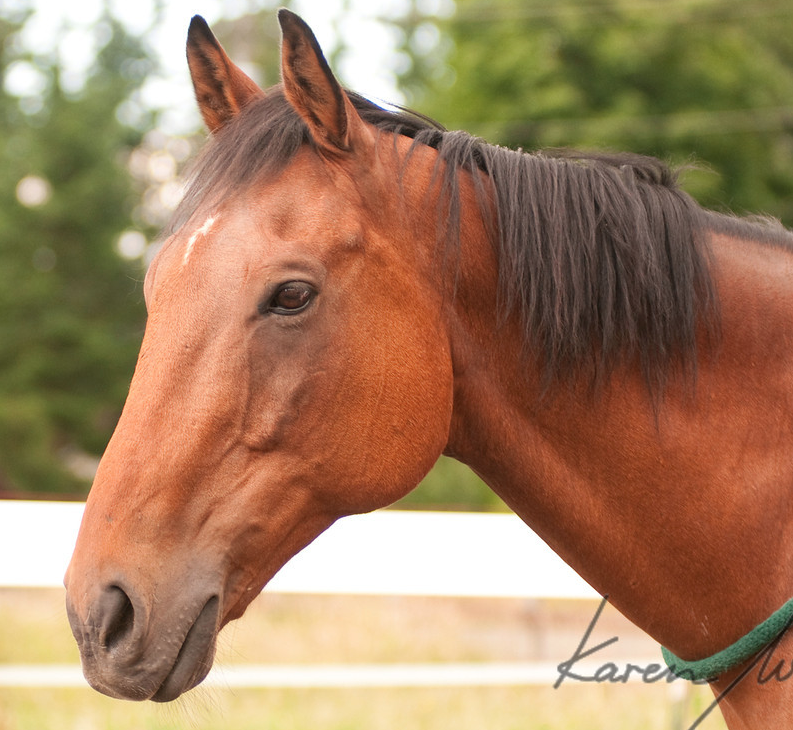 He will be a great horse for someone who doesn’t mind working through his baggage and getting to know the kind, sweet, gentle soul that he is. 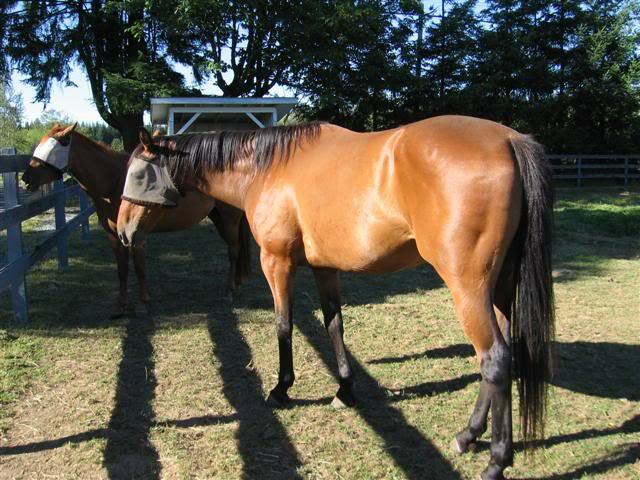 We have photos of Chance taken way back in 2005 when he first became a SAFE horse, and more photos of him taken over the years since then. 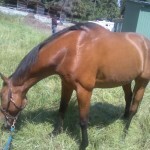 Chance (formerly CBER Waldo) is a 13yo (1999) 16.1hh Bay TBx gelding. 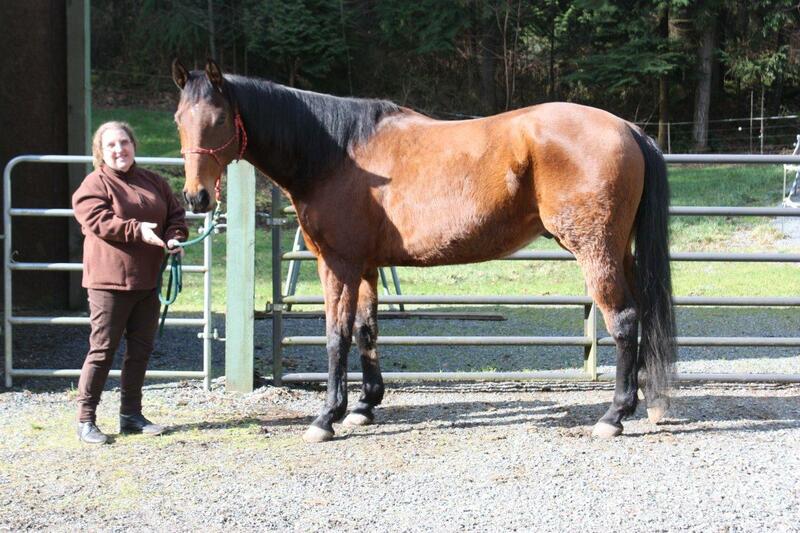 As a youngster, he flunked out of bucking horse school and was rescued from slaughter by SAFE. 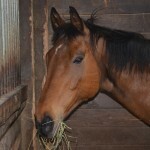 Currently ridden English; previously had some dressage training and an introduction to jumping. Also has trail experience. He is healthy, sound, UTD on all vaccinations and feet. He has bilateral fibrotic myopathy which is a mechanical lameness that is not painful and does not limit his usefulness; but it does affect his gait. He is also very sensitive about having his ears touched. 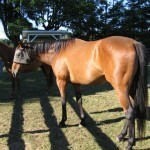 Confident rider a must, he can be hot and is not a beginner’s horse. He is a very sweet snuggler with a big personality.